Alabastron = type of pottery used in the ancient world for holding oil, especially perfume or massage oils. Originated around the 11th century BC in ancient Egypt as a container carved from alabaster - hence the name - but spread via ancient Greece to other parts of the classical world. Amphora = type of ceramic vase with two handles and a long neck narrower than the body. The word amphora is Latin, derived from the Greek amphoreus, referring to the vessel's two carrying handles on opposite sides. Aryballos = small spherical or globular flask with a narrow neck. It was used to contain perfume or oil, and is often depicted in vase paintings as being used by athletes bathing. Hydria = type of Greek pottery used for carrying water. The hydria has three handles. Two horizontal handles on either side of the body of the pot were used for lifting and carrying the pot. The third handle, a vertical one, located in the center of the other two handles, was used when pouring water. Kantharos = type of Greek pottery used for drinking. It is characterized by its high swung handles which extend above the lip of the pot. 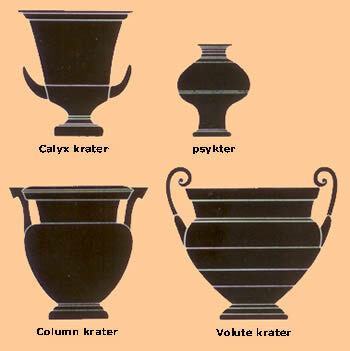 Krater = vase used to mix wine and water. At a Greek symposium, kraters were placed in the center of the room. They were quite large, so they were not easily portable when filled. Thus, the wine-water mixture would be withdrawn from the krater with other vessels. An interesting sidenote to this is that the modern Greek word now used for undiluted wine, krasi, originates from this mixing of wine and water in kraters. Kraters were glazed on the interior to make the surface of the clay more suitable for holding water, and possibly for aesthetic reasons, since the interior could easily be seen. on the interior base of the cup, called the tondo, was the primary surface for painted decoration in the black-figured or red-figured styles of the 6th and 5th century BC. As the representations would be covered with wine, the scenes would only be revealed in stages as the wine was drained. They were often designed with this in mind, with scenes created so that they would surprise or titillate the drinker as they were revealed. Lebes gamikos = form of Greek Pottery used in marriage ceremonies (literally, it means marriage vase). It was probably used in the ritual sprinkling of the bride with water before the wedding. In form, it has a large bowl-like body and a stand that can be long or short. Painted scenes are placed on either the body of the vessel or the stand. 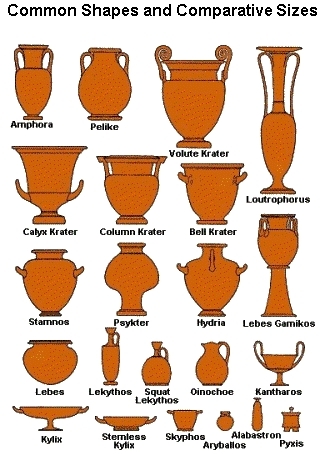 Lekythos = type of Greek pottery used for storing oil, especially olive oil. It has a narrow body and one handle attached to the neck of the vessel. The lekythos was used for anointing dead bodies of unmarried men and many lekythoi are found in tombs. The images on lekythoi were often depictions of daily activities or rituals. Because they are so often used in funerary situations, they may also depict funerary rites, a scene of loss, or a sense of departure as a form of funerary art. Loutrophoros = type of Greek pottery characterized by an elongated neck with two handles. The loutrophoros was used to hold water during marriage and funeral rituals, and was placed in the tombs of the unmarried. Oinochoe = type of Greek pottery used exclusively as a wine jug. Olpe = earliest form of oinochoe. It is characterized by an S-shaped profile from head to foot. Pelike = one-piece ceramic container similar to an amphora. It has two open handles that are vertical on their lateral aspects and even at the side with the edge of the belly, a narrow neck, a flanged mouth, and a sagging, almost spherical belly. Prochus = type of Greek pottery used for washing the hands of the guests at ancient Greek homes. Pseudostomos = Minoan era vessel with a spherical body, used for fluids. It bears a false neck in the middle of the top surface, while the actual neck of the vessel lies next to it. Psykter = type of Greek pottery characterized by a bulbous body set on a high, narrow foot. It was used as a wine cooler. The psykter would be filled with wine, and then be placed in a krater full of cold water or ice. Pythos = large storage jar of a characteristic shape. Anything could be placed in a pythos; however, they were used primarily for grains, seeds, wine and oil. They were commonly associated with administrative and trade centers, which shipped, kept or received large quantities. Rhyton = container from which fluids were intended to be drunk, or else poured in some ceremony such as libation. Skyphos = two-handled deep wine-cup on a low flanged base or none. The handles may be horizontal ear-shaped thumbholds that project from the rim, or they may be loop handles at the rim or that stand away from the lower part of the body.